At Crown Carpets we believe that it should be all about you. Our main goal is to do everything possible to make you satisfied. 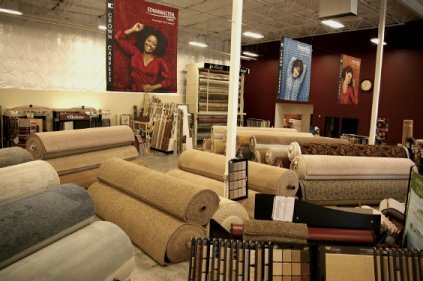 Crown Carpets carries a complete line of products from the world's leading manufacturers. Click on the links below to find out more about these products. Crown Carpets has experienced, quality minded professionals in both residential and commercial markets. Allow me to express my thanks to both Mike and Rick S. They both were true professionals. In todays market place you do not find this very often. Please pass this pat on the back to the both of them and to your management team. Rick: We want to let you know how pleased we are with our new carpet. It looks so nice. Matt did a really fine job of installing it. You took your time and helped alot. We are pleased and will pass your business on to friends and family. Yours truly. To Paul and Crown Carpet staff, I can't say "thank you" enough for your help with creating our new zebra rugs. We were both momentarily stunned and totally delighted with our new "look". And so is virtually everyone who has seen our home since. These rugs are gorgeous! Thank you again for your willingness to think outside the proverbial box! Cliff, your two guys did an excellent job on our carpet installation. They were so speedy, they could have carpeted all 1500 sq.ft. in one day. Unfortunately, we were using the other two rooms for furniture storage. I appreciated that they were here when they said they would be. It looks FABULOUS!!! Thank you for all your coordination on the project. Bob H. and Rick, Another fine job. Thanks for putting us together with the new wood plank vinyl for our kitchen and family room. Looks like hardwood but so much easier to clean. I love it. Duke (our Lab) loves it too. Sheila, Thanks for your incredible attention to detail and following our remodel all the way through. We know we threw some loops at you on time constraints for each room and we appreciate your patient yet cheerful demeanor. The end result is just beautiful. Be sure and thank your installation crew for us. Again, Thank you. Debbie and Staff, Congratulations for winning top honor in the Gresham Outlook and Sandy Post for best floor covering store in the area. You know we wouldn't go anywhere else. Julie M. and Mel D.
Cliff, Thanks very much to you, Doug and Paul, for your combined efforts to get us the carpet we wanted. The result is exactly as hoped! David and Co., The centers new common area looks great. Thanks for pulling the project together and meeting our budget and timeline. We've received many comments from the residents about how good it looks. Cliff and Colleagues, We appreciate the excellent service at every stage. The installation team was equally excellent. I'd call them artists with the way they handled the large pattern in the carpet we chose. It's beautiful! Thanks and regards. Mark, Thanks for a great job all the way around! Travis and Larry were very professional and did a great job for us! We love our carpet and new entry! Henry, Thanks for sharing with us your large collection of notes from happy customers. It sealed the deal to go with Crown for our new floors. The carpet and tile turned out lovely, we feel like we have a new house. Should have done it long ago! Thank you so much. p.s...had to send a note so we can be included in your "kudos" folder. Rick and Crew, Just a quick note to thank you for handling our rental property remodel. As you know it was a mess, and the new renters wanted in. The laminate floors, carpet, and bath vinyl are wonderful and the tenants are ecstatic. Thanks for getting it all together so quickly. Management at Crown Carpets, Thank you. After a long home remodeling project and dealing with incompetent businesses, Crown Carpets helped to restore my faith in a work ethic and professional courtesy which I was convinced to be extinct. Ron in sales, Dennis in scheduling and Joe in installation, the carpet job was flawless. My only regret is that I didn't have Crown do my kitchen floor too, part of my remodeling nightmare with another business. I have told my friends and family about my good experience with Crown Carpets and will continue to do so. I am relieved to discover that there are still some businesses operating whose service people are professional and skilled. Ron, John and I want to thank you for all your help with our carpet. Also thank you so very much for getting your guys here on Monday with such short notice. They were so nice. You have a great crew. Paul, A big thank you for your patience, expertise, and wise information regarding this job. It was a great conclusion to restoring post fire. Your help is much appreciated!